Two food posts in a row! Did you catch my What I Ate In Las Vegas recap yesterday? I’m trying to get back into real life cooking and eating at home mode. Usually I look forward to eating my typical meals at home after being away but for some reason, I didn’t come home from Las Vegas feeling as though I overate or overindulged or anything like that. I came home feeling really normal food-wise, just messed up and exhausted from the time change! Let’s discuss recent lunches for today. Or shall I say recent salads since my lunches have been all salads lately! 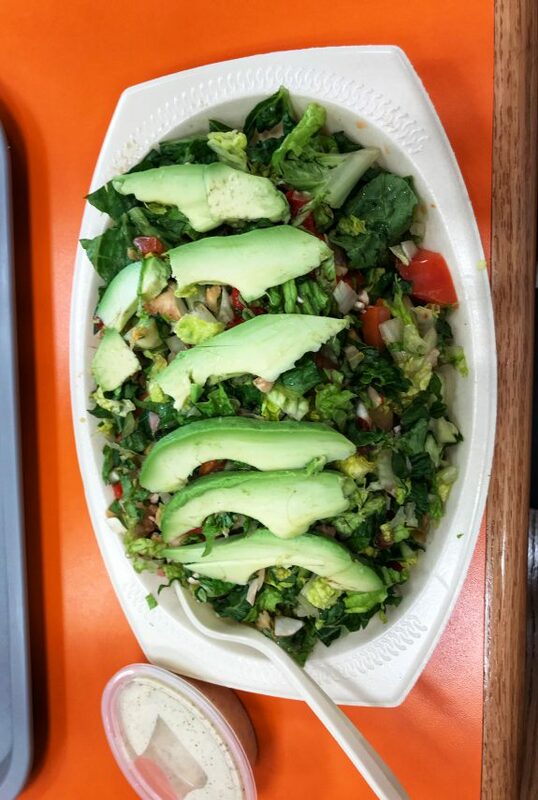 I enjoyed this chopped salad at Town Bagel for lunch with avocado, chick peas and lots of vegetables. Honey mustard dressing on the side. We were due for a Cheesecake Factory visit! One day maybe I will order something other than my favorite salad. Doubtful. My life would feel off-balance if I actually ordered something different at The Cheesecake Factory. Big salad at home, finally! I went to Trader Joe’s to restock the kitchen and only forgot a few things such as my favorite colorful carrot coins, chick peas, black beans, and ugh, now I forget what else. I hate when this happens! I remembered what I forgot (once I got home) and now I can’t recall what it was! Anyway this big salad is the veggies & greens salad mix with lentils, quinoa, avocado and roasted string beans. 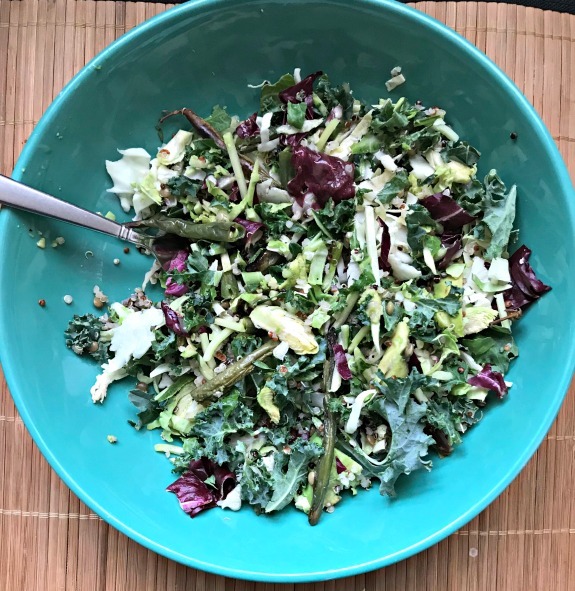 I still really like the Trader Joe’s veggies & greens salad mix a lot. And this doesn’t count as a salad but Hershey’s Conversation Kisses are always welcome in my food posts. 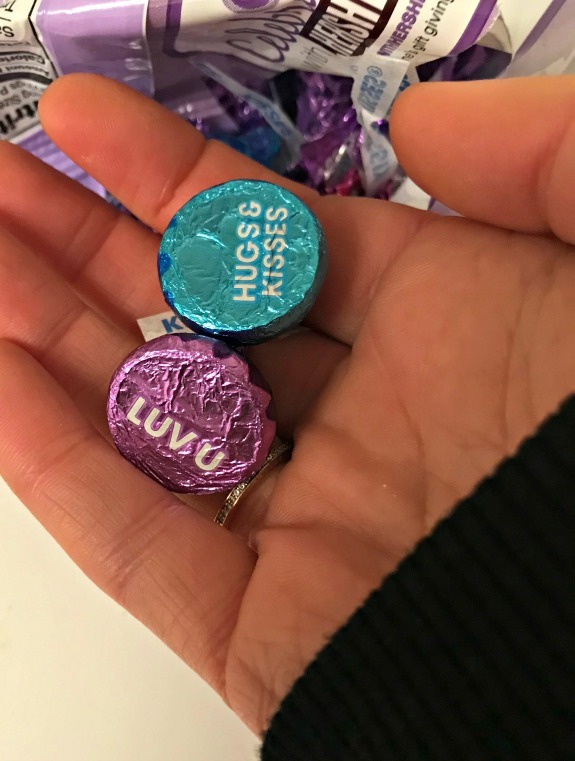 The Conversation Kisses are so cute and I love the colors of the wrappers this time of year too. How do you normally feel when you come home from a trip – do you look forward to eating at home or does it take you time to get back into the swing of cooking again? Do you have a standard order at The Cheesecake Factory? I haven’t been to cheesecake in forever but they have really good lettuce wraps!!! And the only reason I usually want to come home from vacation is because I miss my home cooked meals!! I definitely could be more easy going about eating out but I love my routine. we really like the lettuce wraps too! we get them as our appetizer often! I love eating at home 🙂 My stomach is super sensitive so eating out is almost always risky because I don’t know how my stomach will do. Lunch this week has been smoked chicken and roasted sweet potatoes. I’m definitely a creature of habit! I look forward to eating at home after a trip – I think the break makes me excited to cook again. I always crave big salads after a weekend away! I usually always have a huge omelet for lunch but have had sushi the past 2 days. Sushi Yama on Military and right off PGA Blvd. (if you are ever in PBG!) – they have this spicy tuna wrap that is literally one of my all time favorite foods! Definitely look forward to being home and the ease of eating at home after being away for a while. LOVE the Cheesecake Factory and haven’t been in years because my husband gets too overwhelmed by the menu. They had this awesome chicken with tomatoes and asparagus dish that I used to get – its probably not even on the menu anymore! I haven’t been down to PBG in a really long time! I have one friend still there but my other friend moved from there close to Lake Worth I think? I’m hoping to come down to Florida (boca area though) this summer! This is quite fitting since I’m gearing up to make a giant salad for dinner now that Ave is asleep for the night. 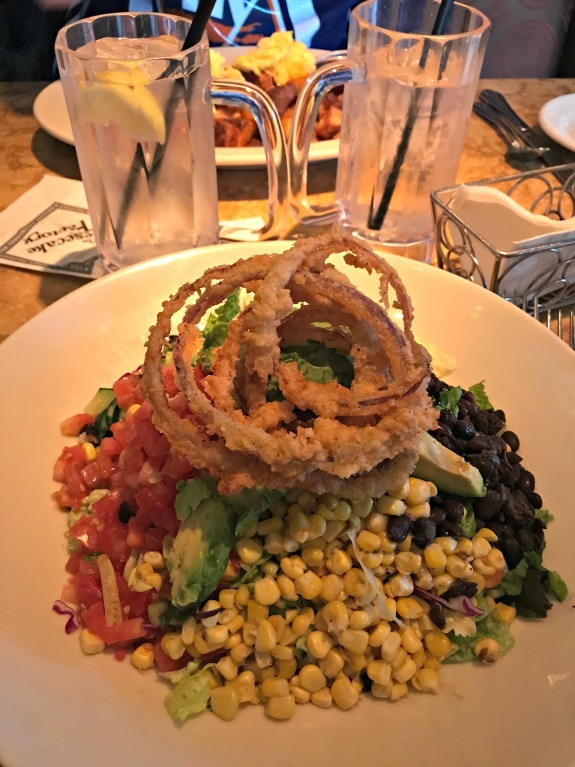 I still need to try your Cheesecake Factory Salad sans chicken.